Watu Godeg Beach Have you ever been to Lumajang? Have you ever enjoyed a wonderful beach atmosphere here. This time we will review about the amazing beach scenery located in Lumajang Regency. 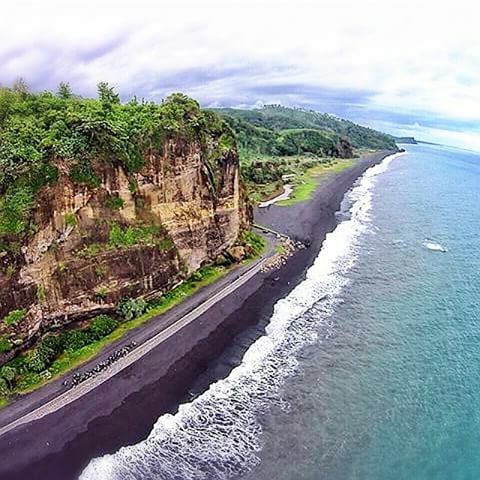 Watu Godeg Beach is an amazing beach located in Lumajang Regency precisely in Tempursari District, offers the beauty of beach surrounded by towering cliffs. Besides you can also find the lush pandan sea trees grow around Watu Godeg Beach, thus making a different scene from every corner. Another uniqueness of this tourism is the presence of towering big rocks lies on the edge of the beach. Indeed not many who know this one, but the panorama offered are amazing. Visit the beach in the middle of the trip you will be treated to a landscape are very fascinating surrounded by swamps around it. The clear swamp water that is different from the marsh generally adds to its own distinct exoticism. To Get There For those of you who will visit Watu Godeg Beach, there are two alternative ways that can be used, from Malang Regency or pass Lumajang District, if you come from out of town you can use plane and transit in Surabaya, firstly, by continuing the journey from Surabaya to Lumajang Regency by using Bus or taxi, from Lumajang Regency you have to continue the journey back to Pasirian Subdistrict, here you can continue the journey back to Tempursari Sub-district through the south coast. Among the border of Pasirian and Tempursari subdistrict is the location of Watu Godeg Beach tourism. Second, you can continue the journey from Surabaya to Malang, from Malang you can continue the journey to Dampit District by Mini Bus, from Dampit you still have to continue the journey towards Kali Bening, then you have to go down to move Tempursari District. Not far from Tempursari District Watu Godeg Beach.